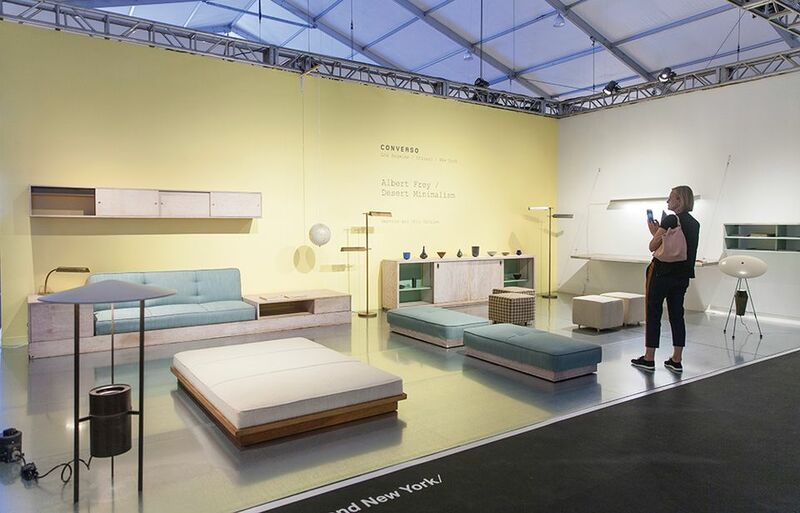 The 13th edition of Design Miami (until 10 December) “is broader than ever”, says the fair’s chief creative officer, Rodman Primack. Thirty-four galleries from nine countries are offering a wide array of Modern and contemporary design, from chairs with cartoon ears to American Modernism at its best. Here is our pick of pieces not to miss. It is hard not to walk past this trio of furry armchairs, which refer to Goldilocks and the Three Bears, without cracking a smile. 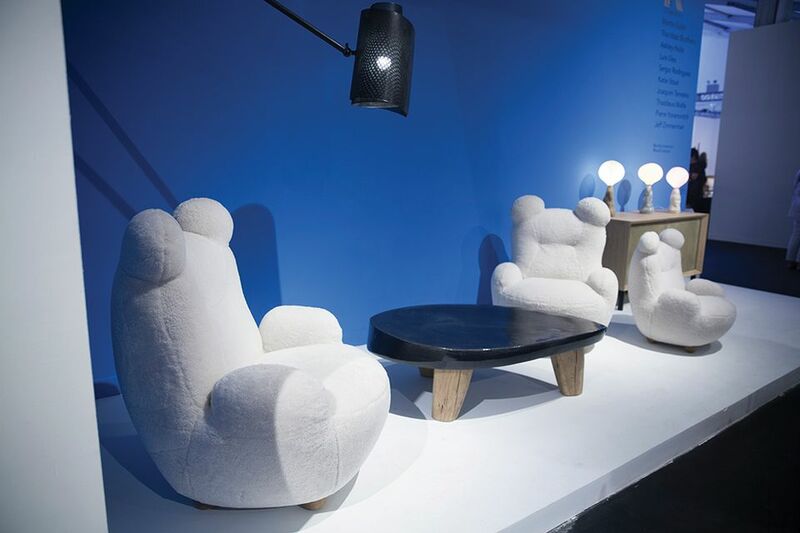 The in-demand French interior designer Pierre Yovanovitch, who recently debuted his furniture at New York’s R & Company, has put a 21st-century twist on a traditional form with the addition of sheepskin upholstery and perky ears—and the finely crafted chairs are also incredibly snug. “I can’t tell you how many people were surprised by how comfortable they are,” says the gallery’s Zesty Meyers. If you are suffering from fair fatigue, this could be just the oasis you are looking for. 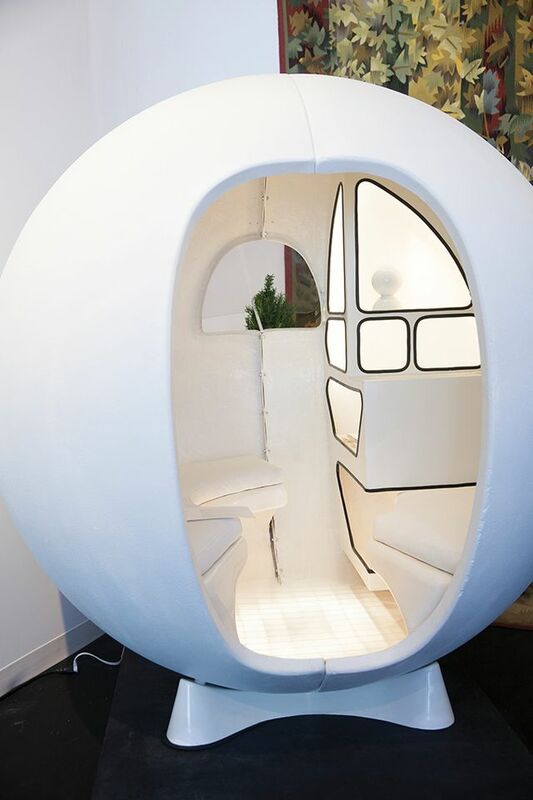 The French architect Maurice-Claude Vidili designed the sleek pod—this is one of only 15—as a space “to stimulate creativity through isolation”. It is made from lacquered polyester and features ample seating for three, as well as a radio to pump whatever tunes are needed to get your inspiration flowing. “We might all need one of these with the way the world is today,” said Rodman Primack at the fair’s VIP opening. 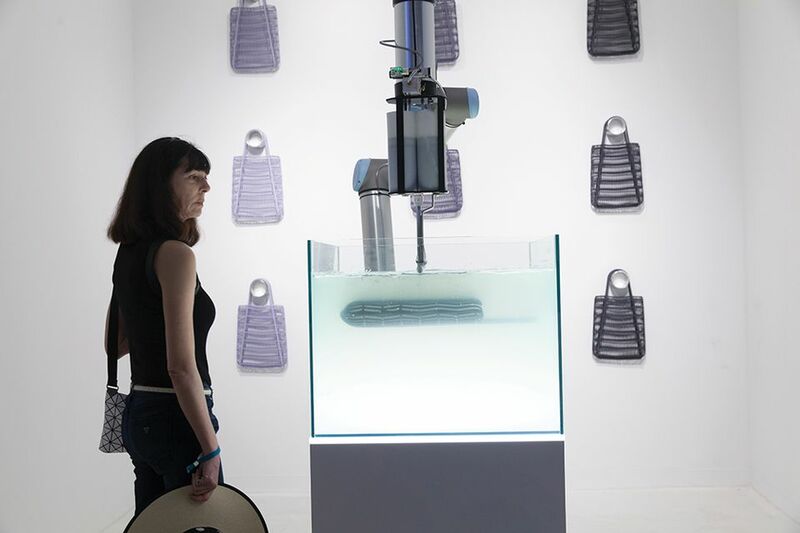 Beach bags may be a dime a dozen in Miami, but how many people can say theirs was made in a tank of gel by a robot? The designer Christophe Guberan, the MIT Self-Assembly Lab and Patrick Parrish Gallery have teamed up to demonstrate the merits of Rapid Liquid Printing, the latest innovation in 3D printing, which makes it possible to create objects quickly using any industrial liquid material, such as rubber, plastic or foam. The bags are being produced on-site at the fair, and a lamp made using this technology is on Patrick Parrish Gallery’s stand. “This could be the first time that Shaker [furniture] is being offered for sale in South Florida,” says the antiques dealer John Keith Russell, whose stand is devoted to historic pieces of 19th-century furniture and tools. 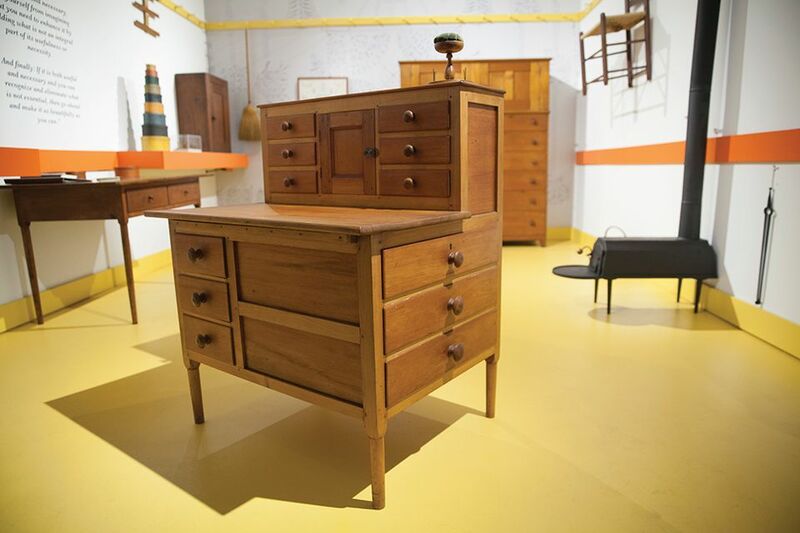 Form was dictated by function when it came to Shaker furniture, and this sewing desk, stripped of all elaborate decoration, is a purely functional piece. Russell sold several objects during the fair’s VIP preview, including a stove, which he jokes is “just what you need in Miami”. Mike Starn says that the brothers’ first official line of furniture developed organically, when it “started growing like fruit” on their monumental bamboo towers, which often include living room-like spaces. This high-backed chair is made from hundreds of bamboo shoots held in place by colourful rock-climbing ropes, and comes with cushions inspired by 19th-century Moroccan saddles. 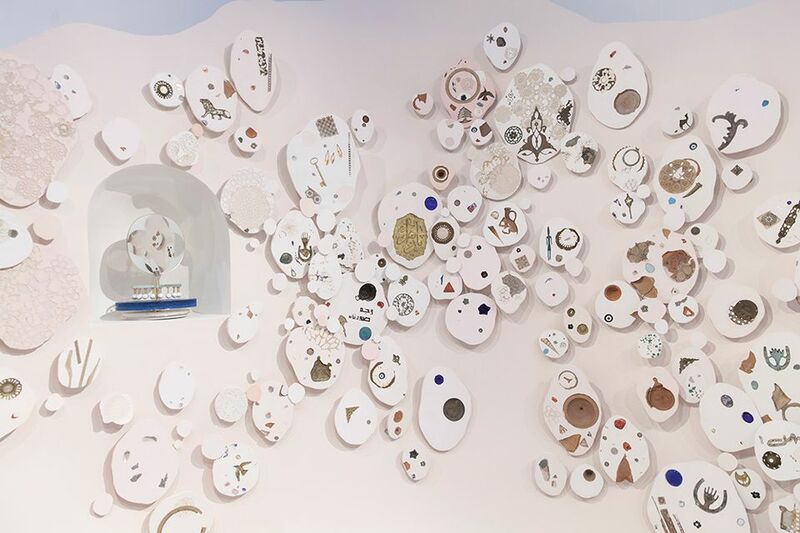 The Lebanese set designer Rami Dalle has taken found objects—such as bronze figurines and pieces of lace—that show his country’s cultural heritage and incorporated them in a series of ceramic plates, or “canvases”, for this piece. Lebanese design is still relatively new to many outside the country, says Cherine Magrabi Tayeb, the founder of the non-profit House of Today, which promotes the country’s emerging designers. “We’ve had a lot of interest from decorators who are looking for something new,” she says. Proceeds from sales will go towards funding children’s education. The gallerist Marc Benda flagged Chris Schanck as one to watch soon after he graduated from art school in 2011. The Texas-born, Detroit-based designer enlists local artists and students to assist him in translating his drawings into pieces of furniture that refer to everything from sci-fi films to ancient iconography. 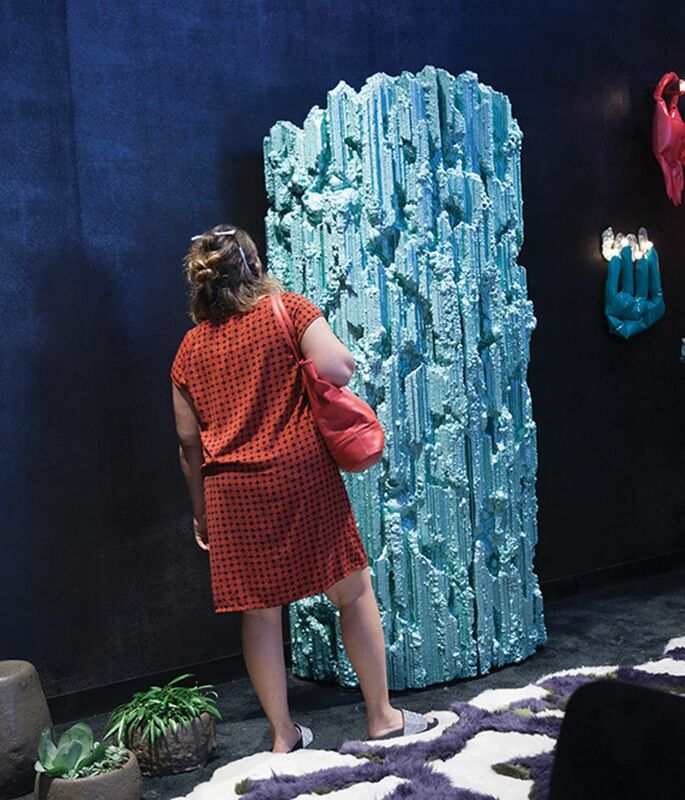 This armoire, which looks as though it is made of crystals, is actually formed from steel, wood, resin, polystyrene and suede. It sold at the fair’s VIP opening. The US gallery has waited eight years for the right moment to show this suite of furniture by the Swiss-born Modernist, who trained under Le Corbusier and worked on New York’s Museum of Modern Art. He settled in Palm Springs in the 1940s, and these pieces, made between 1941 and 1949, come from his private residence, as well as the home of his lover, Elise Wolfe. The sideboard sold for $40,000 and Frey’s signature globe lamp was bought by the publisher and collector Benedikt Taschen, who was a friend of the late architect. 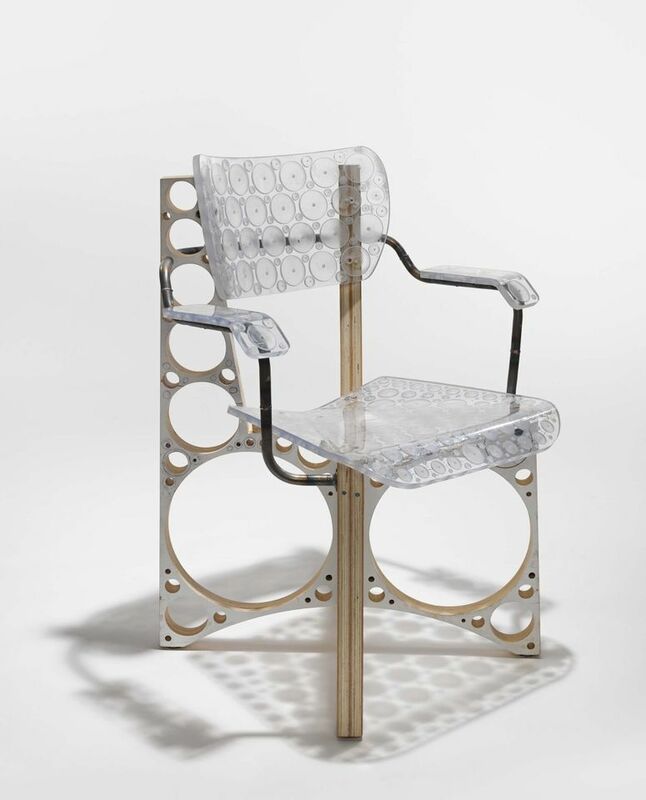 This is a prototype, made in Tom Sach’s studio, of a chair that is being rolled out into production and is available exclusively through Salon 94 Design. Like the production version, it is constructed from steel, milled and thermoformed polycarbonate, titanium and rubber. The plywood base has “lightening holes”, a technique used in the aerospace industry as a weight saving measure that retains strength. The prototype is signed by the US artist and the production versions have a signature plate. 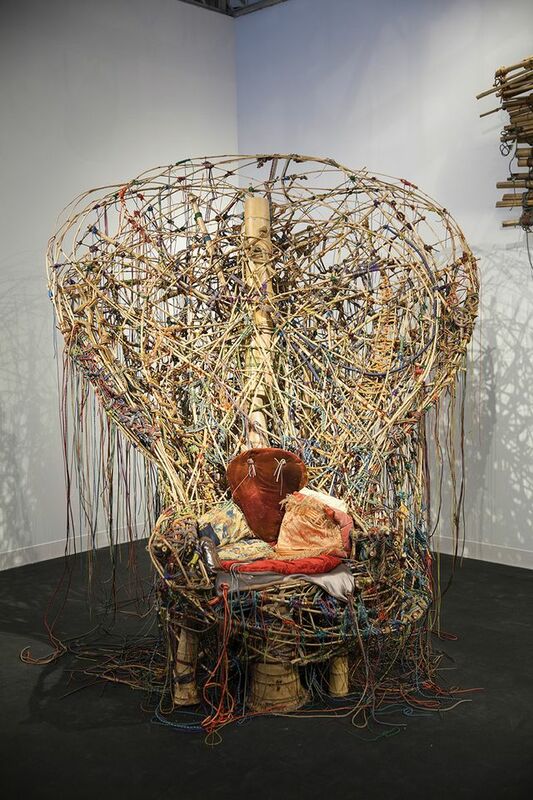 Sachs’s chairs recently appeared in a video by the pop artist Frank Ocean, who was spotted at the fair’s opening.